As applicable today as it was three centuries ago, this abbreviated summary of Franklin’s ideas for thrift carried his fame throughout the world. With a great excerpt from Voltaire, and mention of the graduating class of 23 gentleman at Princeton College, a new treaty with Spain that effects New Orleans, and more. [BENJAMIN FRANKLIN]. Newspaper. 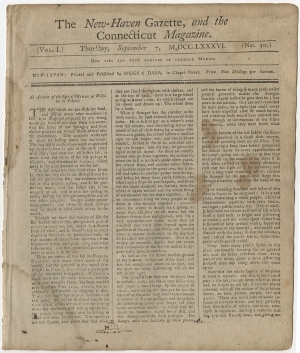 “The Way to make Money plenty in every Man’s Pocket,” The New Haven Gazette and the Connecticut Magazine, September 7, 1786. New Haven, CT: Meigs and Dana. 8 pp. (Vol. I No 30, pp. 229-236), 8 &frac58; x 10 &frac38; in. At this time, when the general complaint is, ‘that money is scarce,’ it will be an act of kindness to inform the moneyless how they may reinforce their pockets. I will acquaint them with the true secret of money catching, the certain way to fill empty purses, and how to keep them always full! two simple rules well observed will do the business. 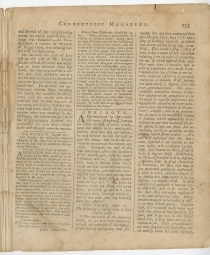 This issue also includes a wide variety of contemporary content, including a report on Polish salt mines (p1/c1-p2/c2); Voltaire’s thoughts on industry and labor (p2/c2-p3/c1); report on the examination and graduation of 23 young gentlemen at Princeton College (p4). European news from London (p4/c1-p5/c1); American news from Charleston, Philadelphia, Princeton, Boston, Worcester, Hartford, and Newport (p6/c1-p7/c2); and a reward offered for the capture of James Spencer, master of the sloop Lively, who apparently transported a load of sugar and rum from St. Croix to Petersburg, Virginia, rather than to New York, and left again with a load of tobacco and bricks. 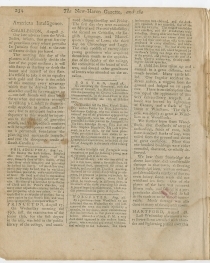 Report on peace between the United States and the Emperor of Morocco, and a commercial treaty between the U.S. and Spain, mentioning New Orleans. (p8). Benjamin Franklin (1706-1790) became famous for the collection of aphorisms and maxims that he published in successive editions of Poor Richard’s Almanack from 1732 to 1758. For the last almanac that Franklin prepared himself, he expanded the preface and created a new persona, “Father Abraham,” who responded to a call from a crowd at an auction asking how to pay the heavy tax burden. Father Abraham’s response incorporated approximately one hundred of the aphorisms and maxims published in earlier Poor Richard almanacs. The new preface, dated July 7, 1757, indicates that Franklin wrote it while on his way to England. 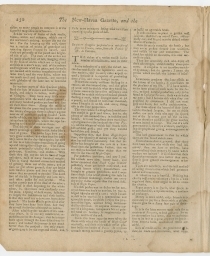 The result became “undoubtedly the world’s best-known homily on industry, financial prudence, and thrift.” In the most common abridged form, it was titled, “The Way to Wealth.” A short version summarizing his ideas became widely known as “The Art of Making Money Plenty in Every Man’s Pocket.” The version presented here in The New Haven Gazette, and the Connecticut Magazine later appeared, in the months after Franklin’s death, in 1790 in London newspapers. It was also used in several biographies and editions of Franklin’s works in the 1830s. 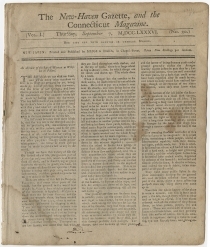 The New Haven Gazette, and the Connecticut Magazine (1784-1789) was a weekly newspaper in New Haven, Connecticut. 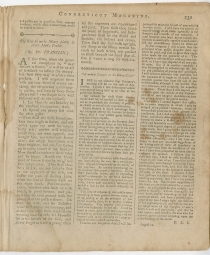 It began as the New Haven Gazette, published by Josiah Meigs (1757-1822), Daniel Bowen, and Eleutheros Dana (1761-1788). 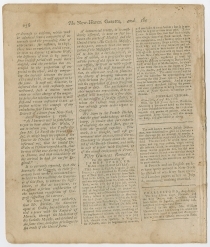 In April 1786, Bowen left the partnership to publish the New Haven Chronicle. Dana left the partnership in August 1787, and Meigs continued to edit the newspaper alone. Good. Some foxing and water staining. Pages separated. Manuscript doodle of a little house on the front page. 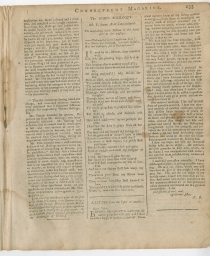 Leonard W. Labaree, ed., The Papers of Benjamin Franklin, vol. 7, October 1, 1756 through March 31, 1758 (New Haven: Yale University Press, 1963), 326-55. 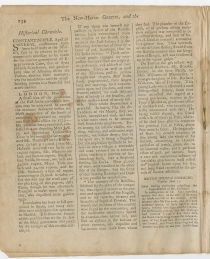 The Public Advertiser (London, England), October 26, 1790, 1:4-2:1; European Magazine and London Review (London, England), August 1790, 90. Benjamin Franklin, The Works of Dr. Benjamin Franklin (New York: Solomon King, 1831), 162; Benjamin Franklin, The Life and Writings of Benjamin Franklin, 2 vols. (Philadelphia: McCarty & Davis, 1834), 2:481; Benjamin Franklin, The Works of Dr. Benjamin Franklin (New York: Frederick Campe and Co., 1835), 122-23; The Life of Benjamin Franklin (Philadelphia: Desilver, Thomas, & Co., 1836), 169-70.